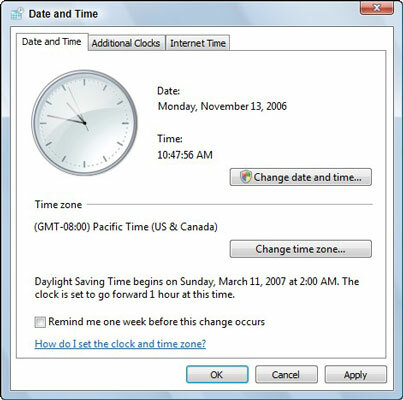 Set the date and time so that Windows Vista accurately time stamps your e-mails and files, schedules tasks, and records events. 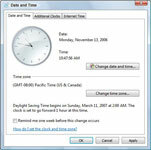 You can change the date and time in Windows Vista by following these few simple steps. 1Press the Windows key on your keyboard. This will display the taskbar if it isn’t visible. This is located on the far right of the taskbar. You can find this option from the shortcut menu that appears. 4Click the Change Date and Time button. In the Date and Time Settings dialog box, click another date on the calendar. Enter a new time in the Time box to change the time. Click OK.
5Click the Change Time Zone button. Find this button from the Date and Time Properties. To change the Time Zone, choose another time zone from the Time Zone list and click OK. This will apply the new settings and close the dialog box.